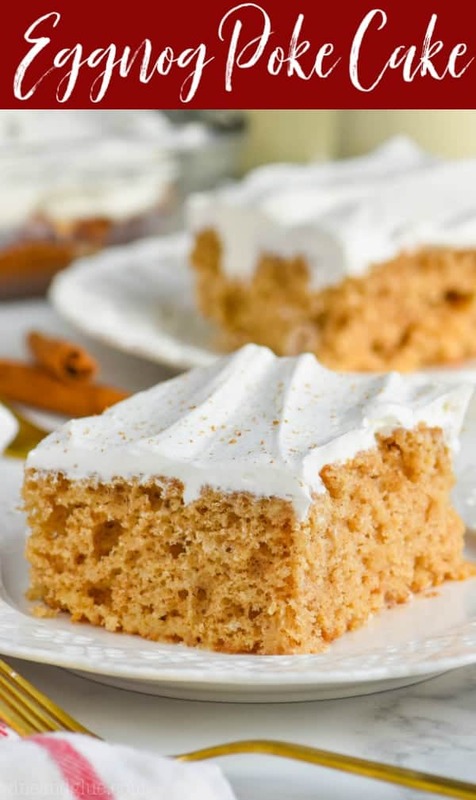 This Eggnog Poke Cake is so simple to make! It comes together with cake mix, a few other simple ingredients, and real eggnog to create a delicious easy holiday cake recipe! If you are looking for another great recipe using the rest of that eggnog, make my Eggnog Fudge! It is melt in your mouth delicious. 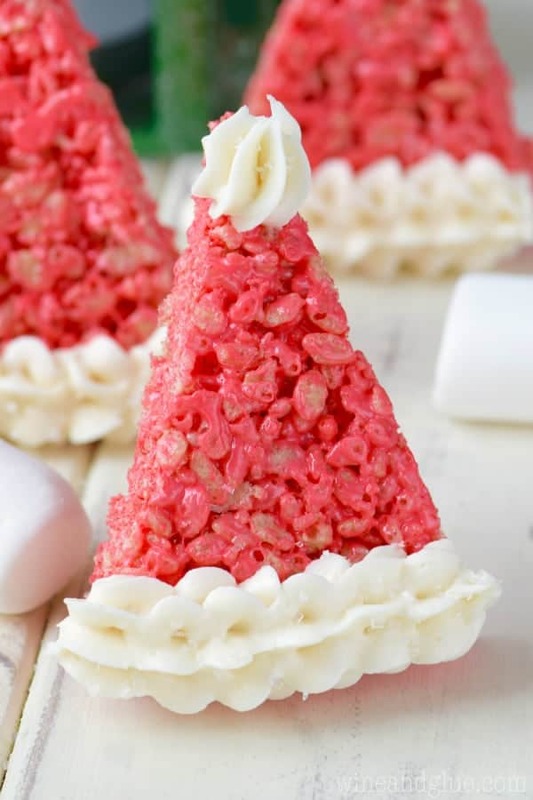 Tis the season for all things treat-tastic and delicious, right? 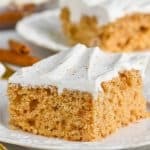 One of my favorite go to and easy treats is a poke cake. 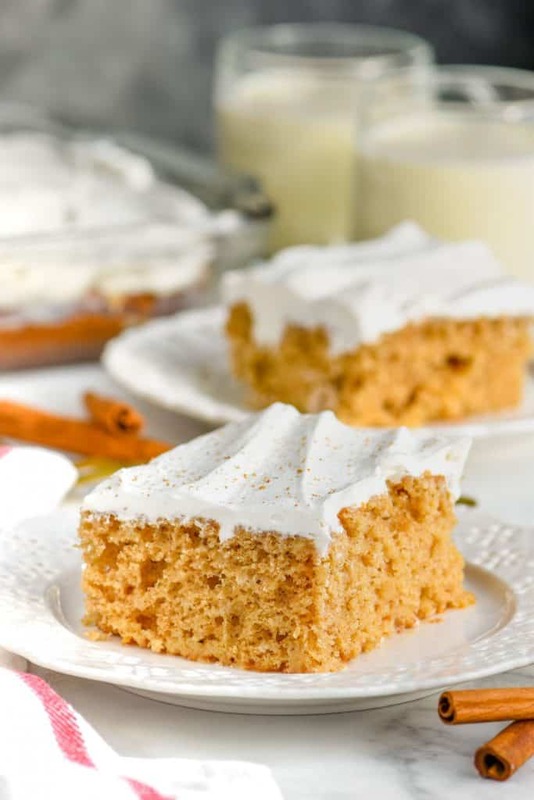 I love that you can take an ordinary yellow cake mix and spice it up with literal spices or so many other delicious things and turn it into a super fun poke cake. 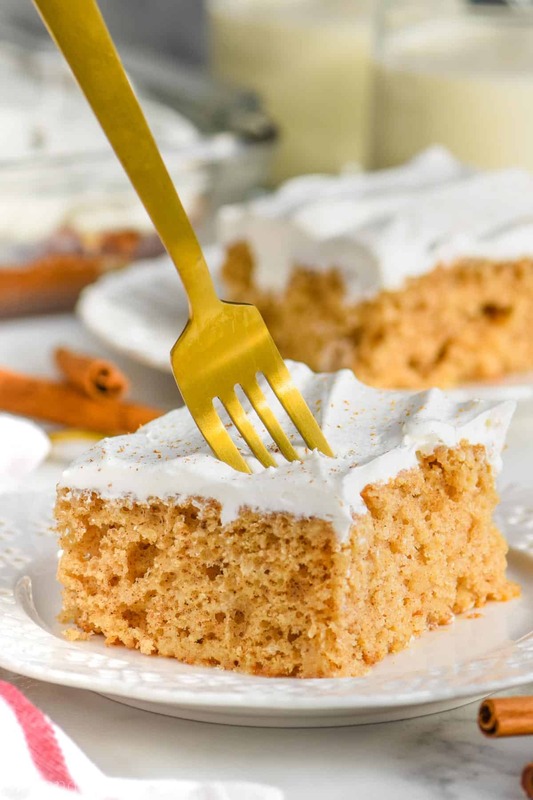 I have so many great poke cake recipes using sweetened condensed milk, including this Eggnog Poke Cake! HOW DO YOU MAKE A POKE CAKE USING CAKE MIX? 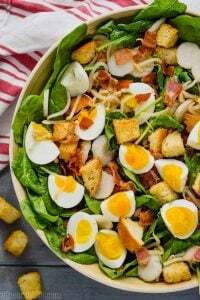 There are so many great poke cake recipes you can use by just jazzing up a cake mix recipe. I like to start by just adding some spices to the dry mix. In this case I added nutmeg and cinnamon. I did the same in my Caramel Apple Poke Cake Recipe. In this recipe, I then replaced the water that the cake mix called for with eggnog. It worked perfectly. 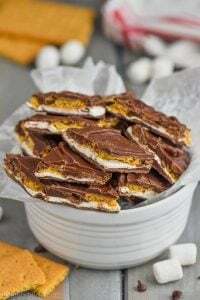 In my Samoas Poke Cake Recipe, I replaced it with coconut milk! 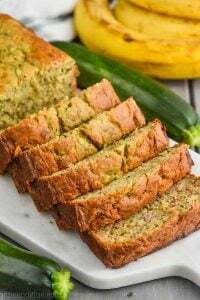 After the cake comes out of the oven, you make holes and add sweetened condensed milk, or something else delicious that works with the flavor profile you are creating. (How sophisticated do I sound? It’s all an elaborate ruse.) In my Bailey’s Poke Cake I added Baileys. In my Watergate Cake, I added crushed pineapple. Yummy! 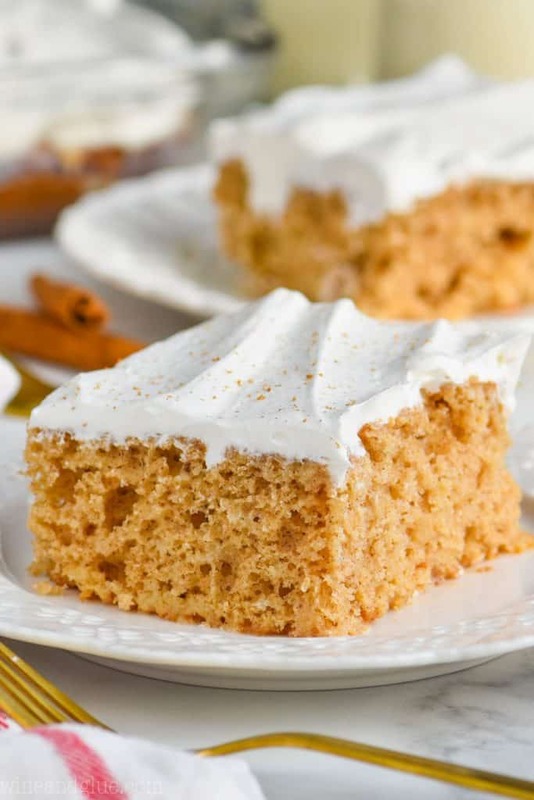 WHAT DO I NEED TO MAKE THIS EGGNOG POKE CAKE RECIPE? White Cake Mix. I Betty Crocker Super Moist White Cake Mix, it calls for eggs, oil, and water. 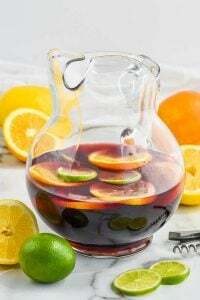 Rum or Rum Extract. This is optional, but I like the little bit of flavor it adds. Cool Whip. If you are serving your cake right away you can just top with homemade whipped cream. If you aren’t, you can make your own stabilized whipped cream with this Homemade Cool Whip recipe. 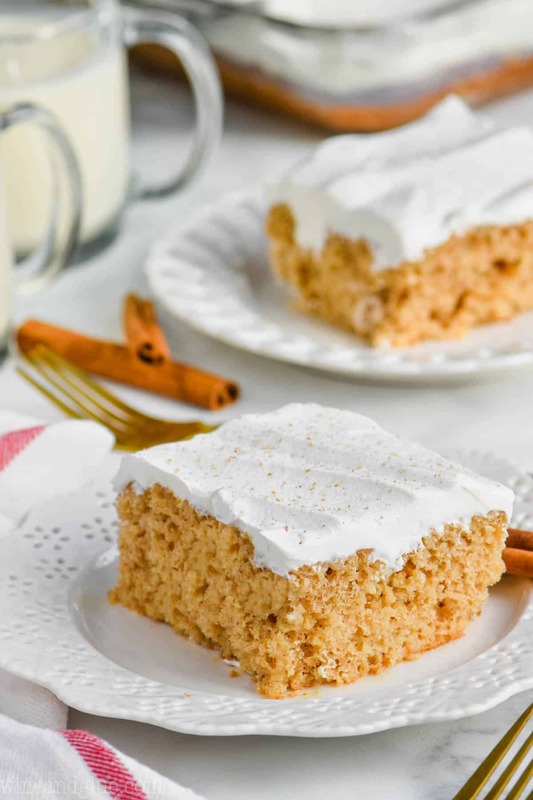 This Eggnog Poke Cake is so simple to make! It comes together with cake mix, a few other simple ingredients, and real eggnog to create a delicious easy holiday cake recipe! Pour the dry cake mix into a bowl. Whisk in the cinnamon and nutmeg. Now mix in the eggnog, vegetable oil, eggs, and rum or rum extract. Pour the batter into a greased 9 by 13 inch pan and bake according to box instructions. After removing the cake from the oven, poke holes in the top. Then pour the sweetened condensed milk over the cake, making sure to get some in each of the holes. Refrigerate at least four hours. Before serving top with Cool Whip. Lightly dust with nutmeg or cinnamon. I used Betty Crockers Super Moist White Cake Mix that calls for three eggs, 1 1/4 cups water, and 1/3 cup vegetable oil. I replaced the water with eggnog. You could use any white cake mix you like, just swapping out the water amount for eggnog. 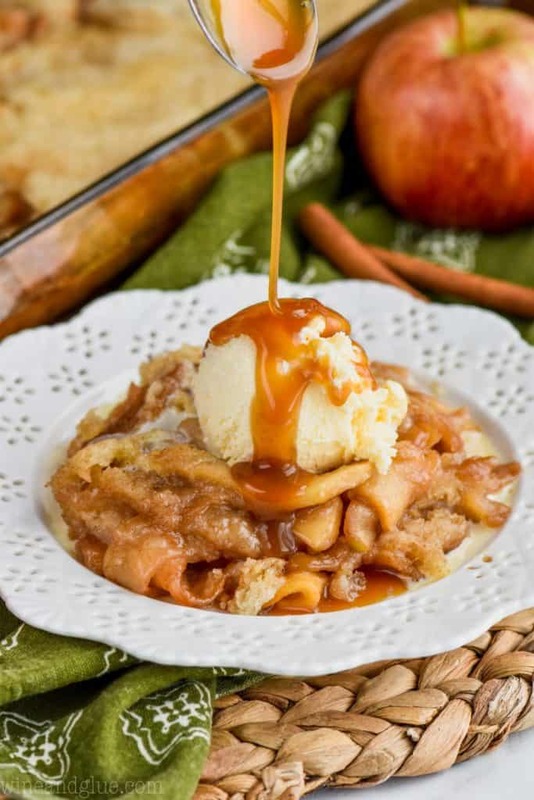 Looking for more great desserts to serve during the holidays? This poke cake looks incredible! I am lovin all of that cool whip on top! 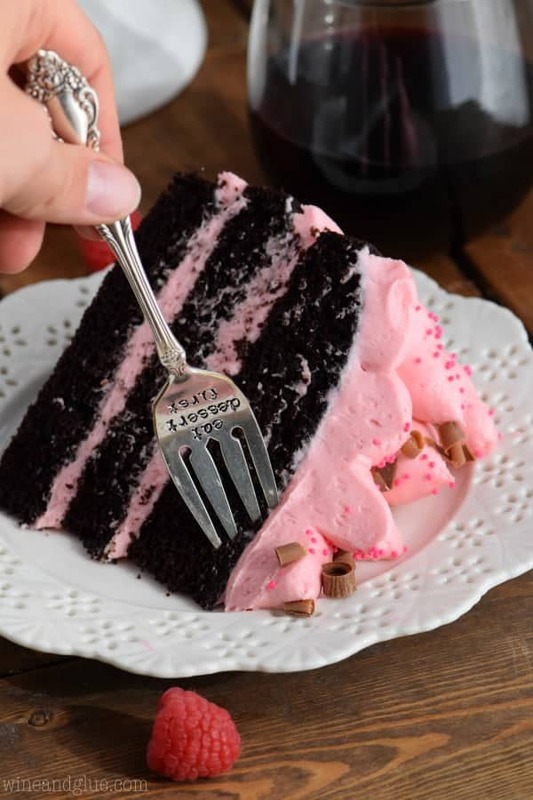 Wow, this cake sounds awesome! I want to dig into a piece right now! 🙂 Pinning! Oh this looks so good. I put an Eggnog Poke cake on my to-do! I’m with you! Especially when it comes to Elf on the Shelf. This morning I forgot until the kids were on their way downstairs….let’s just say it was a VERY close call! I love this poke cake – looks and sounds delicious! So you start off your Holiday recipe with the words “Holy Hell”. Your recipes may be good, but your language could certainly use some improvement. Lol!! And to think that that was a tamed down version of what was running through my head. If the words “holy hell” offend you, then my blog probably isn’t for you. Preach it Lisa. And HOLY FKN HELL that cake looks yummy.